La Bocca della Verità | Where's my backpack? At the foot of Rome‘s Aventine Hill, not far for the Tiber River, lies a medieval church by the name of Chiesa di Santa Maria in Cosmedin. It was built in the 8th century but revamped in the 12th century when a beautifully ornate seven-storey bell tower and portico were added. 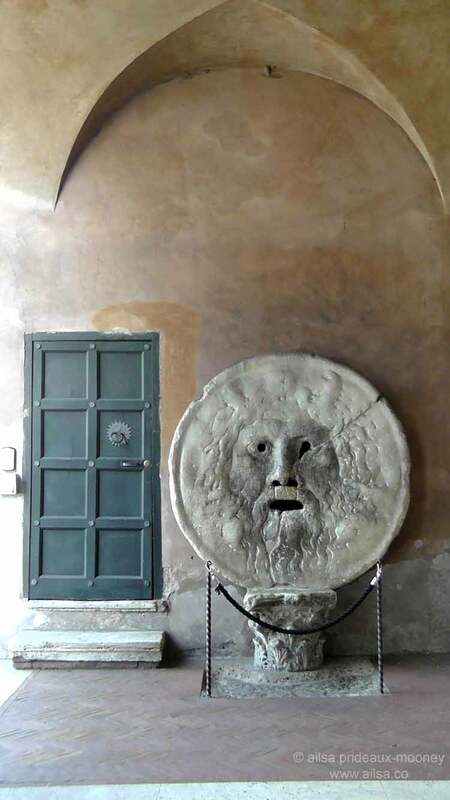 The portico is home to a most unusual and extremely popular sculpture – La Bocca della Verità, otherwise known as the Mouth of Truth, which came to worldwide attention in the classic movie Roman Holiday starring Audrey Hepburn and Gregory Peck. The term ‘Bocca della Verità’ was originally a term applied to public letter boxes in the Middle Ages, where people could anonymously drop letters accusing fellow citizens of sinful behaviour, but it has since evolved to refer to this sculpture in particular. The Mouth of Truth is a huge marble mask which, according to historians, started out as something functional, although nobody is entirely sure what that function might have been. Suggestions include manhole or well cover, part of a fountain, a surface where sacrificial animals were drained of their blood or a water collector in a temple that had an oculus; an opening in the roof that would let in the rain. At some point over the years, however, the mask found a new purpose – that of an ancient lie detector. Locals believed that if you put your hand in the mouth and told a lie, the mouth would close and bite your hand off. In earlier times, those suspected of perjury or adultery were dragged kicking and screaming to the mask and asked to admit their wrong-doings with their hand in the mouth. Legend has it that the Bocca della Verità was outwitted by a savvy Roman lady whose husband suspected her of adultery. He was quite correct; she was indeed having an affair, and when she was brought to the mask, her lover rushed from the crowd and kissed her, declaring his undying love. She denounced him as a madman, saying she’d never seen him before and sent him packing. Without skipping a beat, she stuck her hand in the mouth and declared proudly and truthfully that she had never been kissed by any man other than her husband… and the madman who had just kissed her. 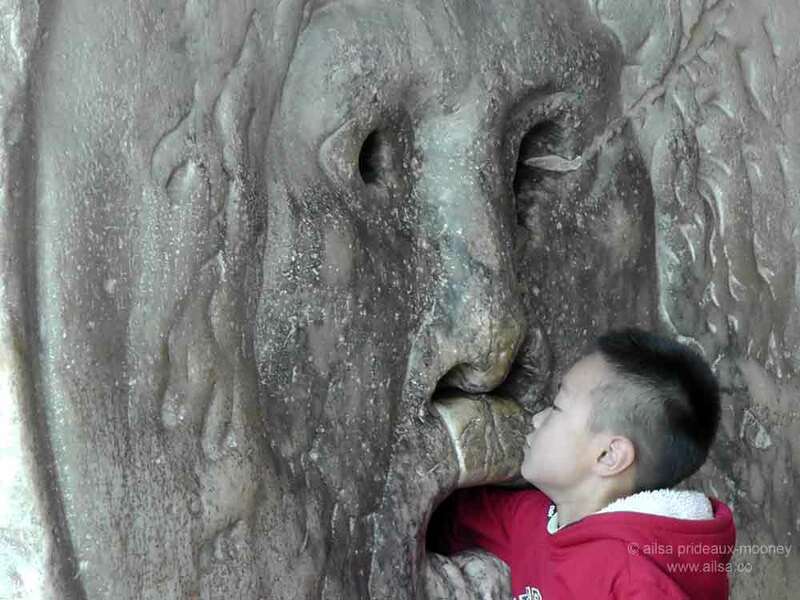 The Bocca della Verità lost all credibility and hasn’t bitten off another hand since. Nowadays, no coercion is required; people line up eagerly to place their hand in the mouth and pose for a photo. I don’t know how many of them willingly risk their hand by telling a lie, however, because that glowering face with its fierce eyes, flowing mane and gaping mouth is still pretty unnerving close up. If you fancy chancing your arm (and your hand) next time you’re in Rome, you can find La Bocca della Verità at Piazza Bocca della Verità 18/Via della Greca 4. Opening hours: Winter 9:30am to 4:50pm, Summer 9:30am to 5:50pm. Admission is “free” but a donation is suggested (€0.50). This entry was posted in Europe, Italy, Photography, Travel and tagged architecture, art, history, inspiration, photography, photos, travel, writing. Bookmark the permalink. Did you put your hand in the mouth, Ailsa? But you ARE a princess of an unspecified foreign country. Thanks to the magic of the digital universe, you rule the tiny nation of Ailsa and we are all your loyal subjects. 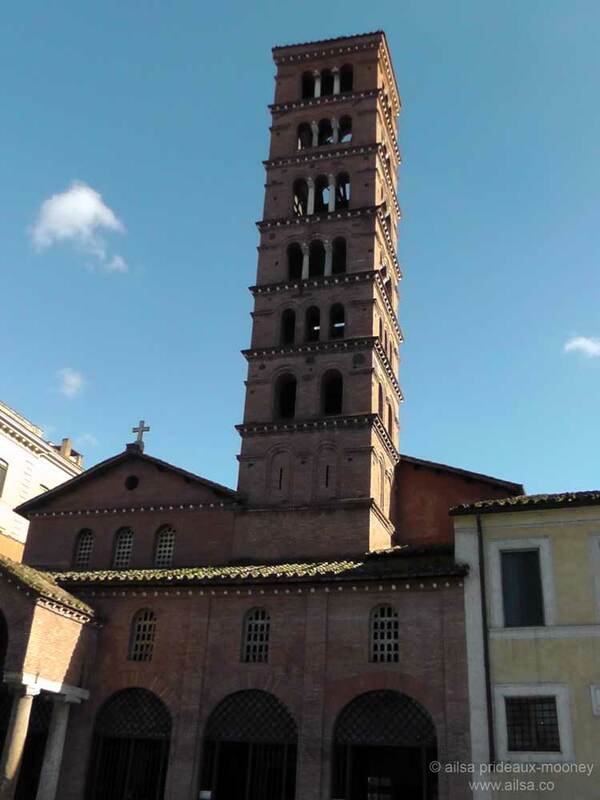 A most fascinating tale you have spun for us today, and while the Boca della Verita is impressive, the tower above it is no less so. Thanks to you, my storehouse of knowledge has been expanded as I traveled to Rome this morning via your post. What a wonderful way to start my day! What a fascinating post! I had never heard of the mouth. I’m always keen for a laugh so will keep an eye open for the movie. We have a very short stop in Rome before our cycling trip in Sept. Would love to see this. I just love it! The story and photography! Unusual sculpture and even more unusual story attached to it! It’s really quite wonderful, Beauty, I love discovering local legends and traditions like this. It’s just as intimidating as I imagined, Gilly; it was quite spooky putting my hand in its mouth. Gulp. Well, for a child I guess it does look scary! Love this, Ailsa. And I love Roman Holiday, so thanks for the reminder. I loved the movie Roman Holiday. Completely forgot that scene. Great post! I’d never heard of this before, but I love anything with an interesting tale so will have to check it out of I make it back to Italy one day. I love the Gregory Peck version of Roman Holiday. What fun it was to learn more about the Mouth of Truth. Thanks! Missed this when we were in Rome….ugh!!!! Great story! I love it when blogs tell a story and inform us about our world through great photography. Well done! How could anyone forget Audrey’s squeal (which apparently was quite natural) when Gregory Peck pulled his ‘handless’ arm from the mouth? Love this, and have never even heard of this place! Thanks for including the picture of the brave child. If I were next in line, I’d do it, but if no one were around, I’d be very, very hesitant!! !